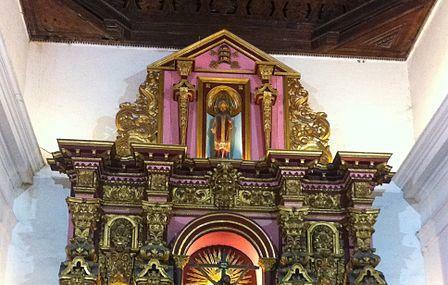 Completed in 1732, this tiny but charming church is among the more popular places to get married in Cartagena. This particular tradition was made famous here by the wedding of Colombian racer Pablo Montoya. Check out the Mudejar paneling, and the Baroque main altar. Also check out the alabaster fonts for holy water on each side of the church. Another historical curiosity is the cannonball displayed on the left wall. It’s an artefact from 1741, when Vernon’s assault sent the missile flying harmlessly into the church. Notably, this is also among the last of the churches built around these parts in the colonial era. Call the church to confirm visiting hours. The priest made all the difference. The church is not as grand as the others nearby but the services and the preaching more than made up for it. And their faith community was very solicitous and more than helpful. It was very WELCOMING!!! Historical.church ; a jewel of the colonial spanish empire in the historical walled city of Cartagena, Colombia. Small colonial church. Good to stop and take a look when you pass by. Beautiful place. Is a historic place with beautiful architecture and religious images.